Q: I was trying to copy and paste Kannada text from a web-site into Excel 2003 spreadsheet. The data is generated using a VS.NET 2003 application in the form of a grid. But the data when pasted appeared as question marks. How to solve this problem? A: Whenever you see question mark that means that the application does not understand what is the encoding used. In Excel instead of simply pasting the text, use the paste special option from the Edit menu. 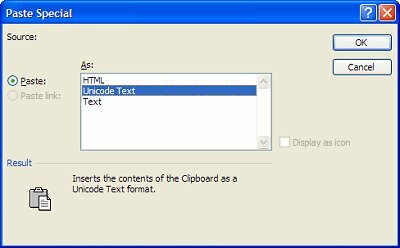 In the dialog box select Unicode text.